My apartment isn't huge, but I believe it's big enough to warrant some form of transit system. Walking is too slow. I want something small enough that I can pack away, yet robust enough that I can take a quick ride to the fridge, if the mood strikes me. On Sundays, I can take that bike ride I've always dreamed of—kicking off in my room, and then a tour around the living room before a stop-off by the microwave for lunch. Then complete the afternoon with a tour way out to my neighbor's front door. 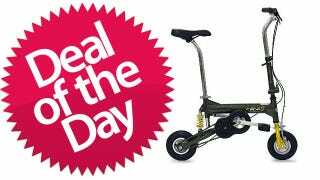 This Kent Mini 8 Folding Bike is the perfect bike for all my (and your!) biking desires. The tires are tiny, so you'll have to get your spindly little legs going pretty quickly if you're planning to enter any races. But the Mini 8's portability means you can take it pretty much anywhere you've ever wanted to take a bike.